How to prevent construction accidents and illnesses related to Spray-foam insulation? Construction workers using spray-foam insulation are exposed to chemicals that can lead to asthma and skin conditions if they don’t use adequate protection. 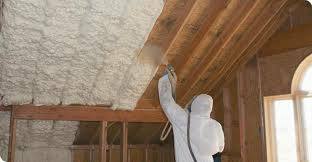 Spray foam insulation is one of the most popular choices for home owners to save energy, however some of the chemicals used to make the foam are detrimental to human health. Spray polyurethane foam contains isocyanates and flame retardant TCPP than can cause severe breathing and skin problems. In a recent webinar from the Center for Construction Research and Training (CPWR) Dhimiter Bello, ScD, MSc; Associate Professor, University of Massachusetts Lowell explained the results of recent studies and summarized the risks of exposure to dangerous chemicals in spray foam insulation associated with current work practices. Overall airborne exposure to spray foam insulation are usually below OSHA recommended levels but some risks are still unknowns and under evaluation (see blog from Center for Disease Control and Prevention). The risk of dermal exposure is elevated for both exposure to isocyanates and TCPP and is a major concern when using SPF applications. Nitrile gloves as well as breathable coveralls such as Tyvek or PP provide construction workers with significant protection when used during spray-foam insulation applications. It is important that Nitrile gloves be at least 5 mil. thick to provide a better resistance to wear and tear. Too many construction workers especially immigrants and those working for small contractors are not proprely trained and aware of best practices related to application of spray-foam insulation. Additionally workers nearby such as quality engineers, and other construction crews such as electricians can also be exposed. They should also be trained and be aware of best practices related to Spray Polyurethane Foam (SPF).